They're hard to keep out! Do you want to Catch Turtles? You're with the experts now! 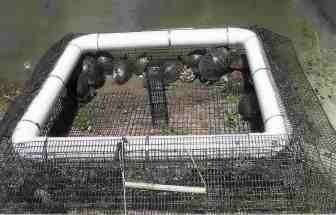 We have a choice of 9 Traps for Turtles. Heinsohn's Country Store has traps specifically for catching certain species of turtle. 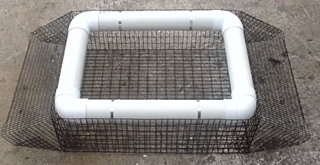 We have underwater traps for catching Snapping Turtles or Softshell Turtles and we have floating turtle trap for catching basking turtles such as Red Ear Turtles, Mud Turtles or Sliders. Frog Trap We'd like to hear from you. If you have pictures of what you caught in your trap click here to send them to us. 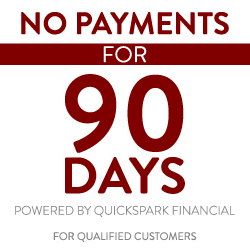 We would love to share how our product worked for you!! This is the first trap for turtles that we built! It worked great but a little too big to handle. Now the freight rates came up and we are no longer building them. It has to ship via truck which is no longer cost effective! We also discovered that we could send you two Sundecks via UPS for less than we could ship just this one trap. Two traps in unique locations are much more effective than one large trap! This Trap really Works! Caught 26 Turtles in 2 weeks, caught 11 more by the next weekend. Sorry, not U.P.S.able. THIS THING IS BIG! Approx. 66 in. X 66 in. Just barely fits in the back of your fleetside pickup truck Now made with vinyl coated wire! Wire ramps make climbing into our trap a natural for turtles! 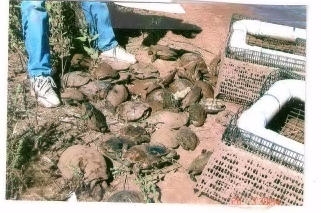 Second Image--John Farrell caught the 29 turtles in the picture on the right in only one week on the Jim Sherman Property. This also shows the new Solarium Trap with the vinyl coated wire and PVC handles. These traps really work great! Has Bait tower in center for chicken necks or fish! ***NEWS UPDATE*** John just informed me that he has caught 101 turtles in only 7 months! Now that you know how to catch a lot of turtles -- would you like to know how to catch a lot of fish? Just click here! 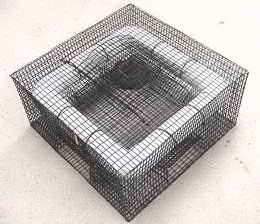 Our Most Popular Trap for catching Turtles! 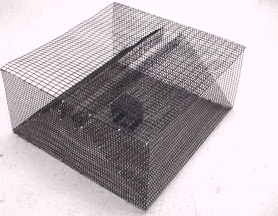 Our most effective trap for catching basking turtles which includes Red Ear, Slider and Mud turtles. We can ship this trap right to your door! You can begin catching turtles the same day. It catches turtles just as well as the trap above. Just remember to check the trap often and clear all turtles but one each week! The one remaining turtle encourages others to join him! Approx. 46 in. X 28 in. X 12 in. Has Bait tower in center for chicken necks or fish. Anchor in shallow side of the pond with twine (890139) below. Floats with only 1.5" of trap showing. 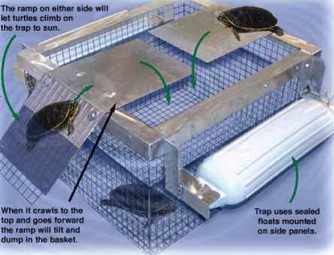 Turtles can easily climb submerged wire ramps up onto trap. 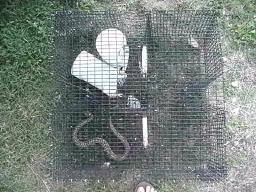 A little smaller than the large trap above but it is U.P.S.able. We can ship this trap right to your door! You can begin catching turtles the same day. It catches turtles just as well as the trap above. Just remember to check the trap often and clear all turtles but one each week! 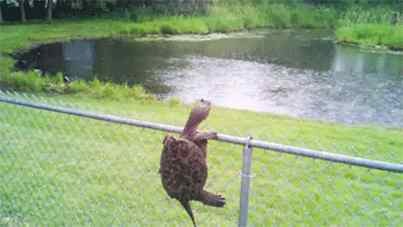 The one remaining turtle encourages others to join him! Approx. 46 in. X 28 in. X 12 in. Wire ramps for easy climbing! 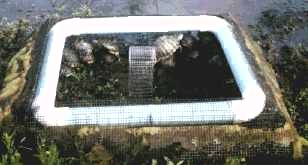 A smaller version of the popular Sundeck Turtle Trap. Designed especially for smaller ponds. 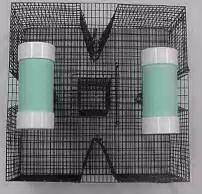 Made with smaller mesh vinyl coated wire so it will hold much smaller turtles than the standard Sundeck Turtle Trap. Will capture turtles smaller than 2". Approx. 39 in. X 23 in. X 11 in. Wire ramps for easy climbing! Used for mainline of trotline. Also good for positioning traps. 100% Twisted Polypropylene, 3/8" Poly Rope 50 ft. Load limit is 244 lbs. Used to anchor Hoop Nets, Turtle and/or Snake Traps. It can be used to tie to a tree limb over the water, to stretch between 2 objects, or anchor traps to a dock area. 100% Twisted Polypropylene, 1/4" Poly Rope 50 ft. Load limit is 113 lbs. Used to anchor Hoop Nets, Turtle and/or Snake Traps. It can be used to tie to a tree limb over the water, to stretch between 2 objects, or anchor traps to a dock area. This trap is pretty handy for catching a bunch of frogs. Just set it out in the water and let the solar light charge all day. Then when night falls the light will attract the bugs inside the trap and the frogs will be searching for dinner and get caught. Trap measures 23"x 23"x 11".Holds lots of frogs! Solar light replacement for the frog trap sold above. Catches turtles unseen and humanely! Especially designed for Koi and Goldfish ponds. Small enough to be hidden yet keeps ponds free of predators. Bait tower holds baitfish to attract predators.12"x12"x24"
Use frogs or fish (Goldfish are good) for bait - will drown snakes for safe handling with current configuration. Floats can be mounted on sides to keep snakes alive. Anchor in shallow side of the pond with twine. (890139) . We had a little surprise when we went out to ship a floating snake trap. When we got there - there was already a snake in it! No, it wasn't a cottonmouth water moccasin but it was sure nuf trapped. Thought you might like to see this! And it wasn't even baited with a live mouse like we suggest for land based trapping! Probably was a grasshopper in the trap that sucked him in! Made of 1/2" x 1" vinyl coated wire for water snakes like the Cottonmouth Water Moccasin - 24" x 24" x 12" size for large snakes. Use frogs or fish (Goldfish are good)for bait - will drown snakes for safe handling with current configuration. Also great for catching mud cats and hard heads. Do they work? Tom from South Carolina is pleased with his! Bait bags are really handy with this trap. 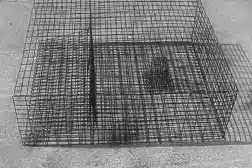 Wendy from Virginia says she caught (1) 15# and (2) 30# Snapping Turtles using this Hoop Net! And she has only been using the Turtle Hoop Net for a week. Wow! Thanks for the E-Mail Wendy. We're confident you'll catch your turtles but when we have customers say "I know firsthand that it works", that makes us smile! PROOF IS IN THE PUDDING.. OR TRAP, IN THIS CASE! New! The Turtle Tunnel !Make Life Easier !! 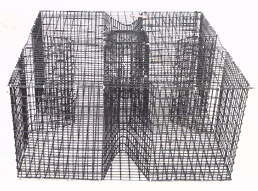 Floating Turtle Hoop Nets 42" X 16" with 1 1/2" mesh - Especially good for Snapping Turtles. It floats so it keeps turtles alive and fresh. Some snapping turtles may not want to sun themselves on the Sun Deck. This is a surefire opportunity to catch those water type turtles. It is much easier to fish because it is less work setting the trap and removing turtles. Simply attach it to twine (890139) . on both sides of the pond and pull it in when you need to remove the turtles Trap will also catch fish with the right bait - Check your local game and fish regulations! A bait bag is helpful for controlling the bait and keeping fish from eating it. Mesh bags for bait for hoopnets. 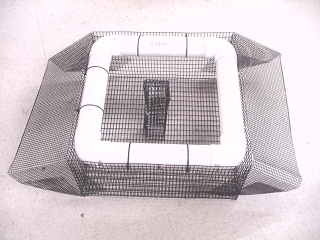 (9"X7") Nylon Bag easily contains bait, Fill with bait of your choice and tie into hoopnet on line that leads from inlet funnel to rear of trap. 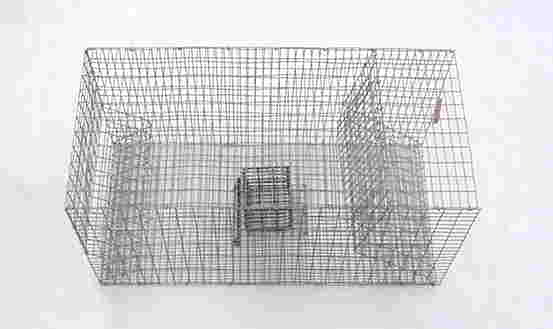 This trap has an aluminum frame and ramps and the basket is made of 1"x1" 14 gauge galvanized wire. Just place trap in water, tie rope to eye bolt so the trap can be pulled into shore when needed. Best used for basking turtles. Should be baited for snapping or softshell turtles. Don't know what to do with all those turtles you catch? Try Momma's Snapping Turtle Stew!